Typically "B" models denote a change in the movement grade within a specific model. The nomenclature was used only in the 1950's and started when the 12/0 grades replaced the 14/0 grades that were used previously. There was another wave of B models when Hamilton switched from using excess Swiss-made Hamilton Illinois movements and started to use different Swiss-made Hamilton movements. There is one B-model though where there is no non-B version of the model in the catalogs. 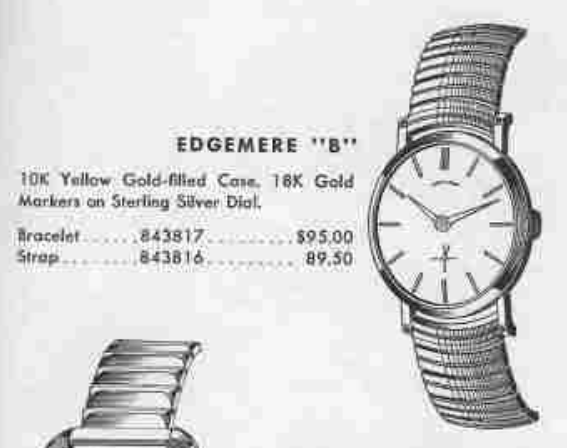 It was called the Edgemere B and introduced in 1956. The Edgemere B was produced for three years. The Edgemere B came in a 10K yellow gold filled case. It's one of several large, round models that featured Hamilton's high grade 22 jewel 770 movement. I wonder if there were plans for a non-B model with an 8/0 730 movement and they just scrapped the idea when the 770 came along. Tucked inside the case is a sterling silver dial with solid 18K gold markers. I recently picked up an Edgemere B because the price was right and I liked the inscription on the back. You can't really tell in the picture below, but the dial has some finger prints on it that I hoped I could clean off. I noticed while taking the photo that it's also missing an hour marker at the 7 position. One of the reasons I bought the watch was the presentation on the back. It's very nicely done and 40 loyal years is a commendable achievement. The case is a two-piece design with a front bezel and a case back. The seam between the two sections is in the middle. You can see that the prior owner put the bezel on wrong, as the recess for the stem is visible on the wrong side. I was hoping I might find the missing hour marker inside and sure enough, I got lucky... there it is inside the case back. The 770 movement does run but it's pretty dirty and definitely ready to be cleaned again. The 770 is a nice movement and Hamilton designed the movement with watchmakers in mind because it goes together very smoothly. The reassembled movement goes onto the timer and it's running great, right out of the shoot. Well, my light tent makes the reassembled watch look a lot worse than it really is. I was not successful in removing the spotting from someone's finger prints. It doesn't look as bad in real life. However, it would be a simple enough design to get redone correctly - so I will probably send it out to be refinished. I guess while I am at it, I can have the wear through hole on the back of the stem tube repaired by my local jeweler. With a refinished dial and a restored case, the watch would be returned to it's formal glory. I decided to get the dial redone and I think it was a prudent choice. It looks much better now, don't you think? Thanks to a fellow collector and fan of the site, I was recently informed there is, in fact, an uncatalogued Edgemere. This model is presumably from the 1954 / 55 timeframe and used the 8/0 sized 747. Why it didn't carry on with the 730 and got the 770 instead is still a mystery but at least there's evidence of at least one Edgemere out there.